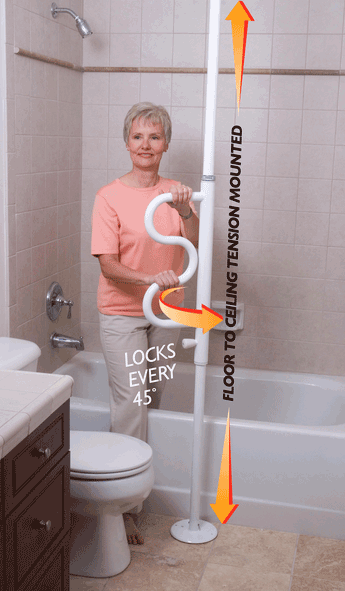 Stander Security Pole and Curve Grab Bar offers a secure and safe support structure to assist mobility patients with transferring from a sitting position to a standing position. 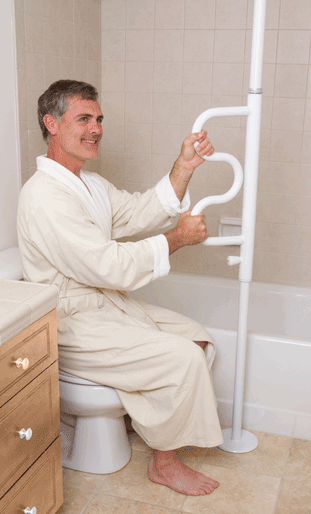 The curved grab bar on the pole is ideal for chair-side, bedside or Bathroom Assist to rise to a standing position or to remain steady during transition. Wall mounts are not needed for this Assist Device. 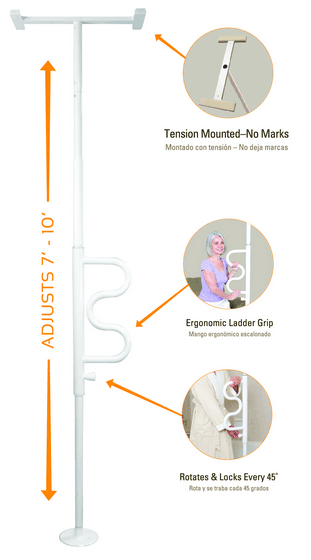 The Stander Security Pole with Grab Bar secures between the ceiling and the floor and can be uses anywhere in your home or hospital room. 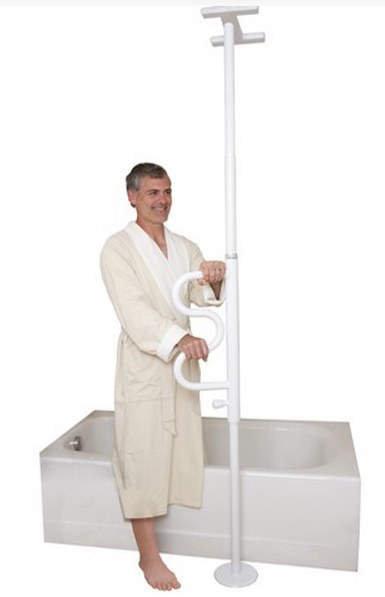 The Curved Grab Bar has 4 handles to allow patients to climb to a standing position while also providing support. Manufactured by Stander, the Curved Grab Bar also pivots, locking in place at 8 points every 45. Installation is simple and secure. 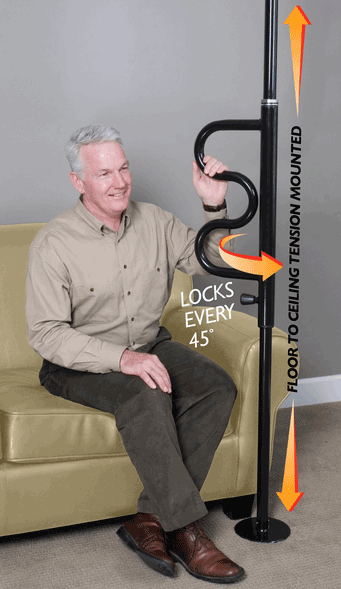 The floor to ceiling Security Pole and Grab Bar is tension mounted and comes with its own wrench so no other tools are required. 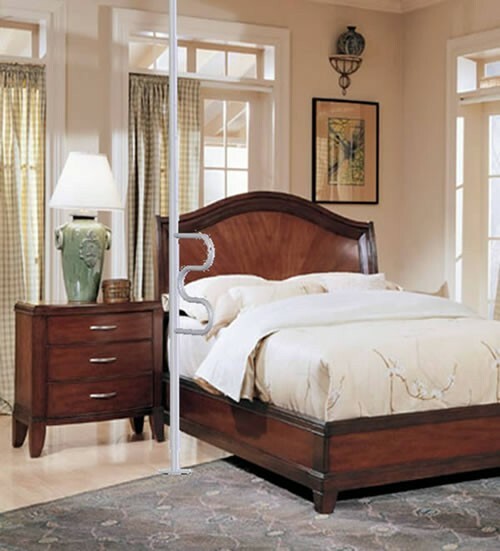 Floor to ceiling pole with pivoting Curve Grab Bar that locks in place at 4 different positions. Fits ceiling heights 7 to 10 feet. 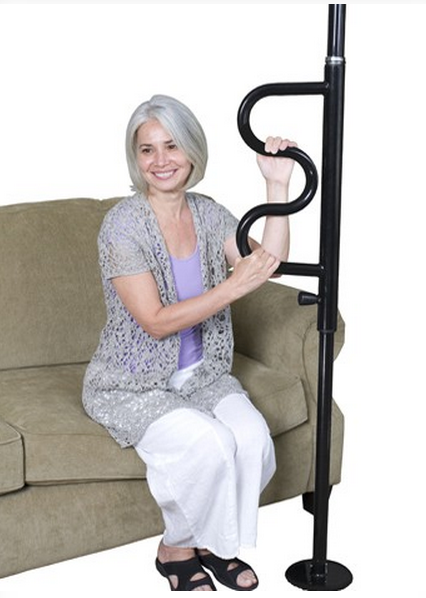 Portable Pole and Grab Bar: Main pole easily separates into two 53" pieces making it easy to transport. No need for wall mounts. Can be installed in virtually any area of a room, exactly where it is needed. 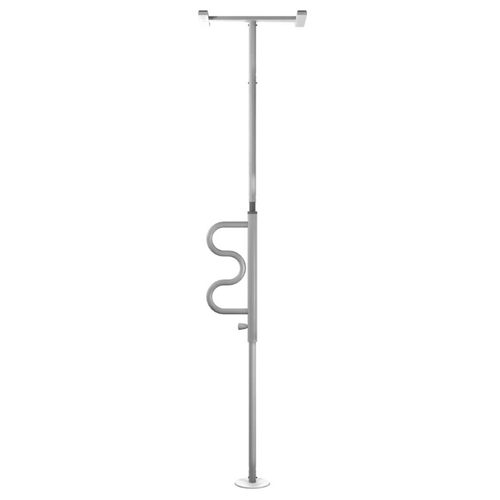 Security Pole with Curved Grab Bar Product Number: 1100W (white); 1100B (black). Fits ceiling heights range of 7 to 10 foot ceilings. Hi, I am Troy Miller and I am going to show you how to assemble the Security Pole and Curve Grab Bar. First, we'll start by layering all the parts on a flat surface. Here we have the floor plate, the lower pole, the upper pole with extension, the ceiling assembly, the hardware and the instruction sheet. Okay. First, we're going to install the lower tube into the floor plate by just setting the pole inside the sleeve and rotating the tube until it drops. Okay. At this point, you need to determine what your ceiling height is. If its above 8 feet, you'll have to keep the extension piece in. If its below 8 feet, you'll take it out. First, we'll assume that its above 8 feet. Align the holes in the tubes. Place Clevis pin through the holes and insert the Cotter pin on the other side and then the tabs to secure it. Okay, next we'll take the ceiling assembly and install it into the upper pole by aligning the holes, inserting the Clevis pin through the holes and securing it with the Cotter pin. Okay. Now insert the threaded portion of the upper pole into the lower pole. And with the included wrench, tighten the knot in a clockwise direction until the product becomes secure between the floor and the ceiling. As an option we've included these screws to secure the ceiling assembly and the base plate. Now your product is ready to use. is this freestanding or does it need to be screwed into floor and ceiling? The bar needs to be installed; however, it doesn't require screws for anchoring. Complete instructions are available on the product's page. Would this work easily without drilling holes in the ceiling or the floor? According to the installation instructions these require screws to be drilled into the ceiling. We recommend trying other grab bars for something that may not require such installation requirements. i hate this product. It is big, black and extremely bulky. It is ugly. I did not know that it had to be drilled into the floor. it was meant for my bathroom and it is hideous. i would return it but there is a 40% restocking fee so it's not worth it. This is a great product! I purchased the first one after my mom had hip surgery. She had a difficult time getting up from the couch. I purchased a 2nd one for her bedside. She felt safer having something steady to hang on to when transferring. I recently purchased a 3rd! She needed support getting in and out of the bath tub lift chair. I could not recommend this product enough!! It is very durable and has a nice higher gloss finish that is easily cleaned. Thank you for making things easier and safer for my family! The ease of installation and the endless options of placement! I honestly cannot think of anything!! Purchased two within a month of discovering the assist pole product. Purchased three so far, may need a fourth to assist with getting in and out of bed. Our son is a disabled Vet. He is much younger than most of the folks pictured in the ads. This is our second pole. He uses it frequently to get up from the chair. The new one is used to get up and down from the rowing machine. The pole is exceptionally well engineered. adjusting the height and location of the arm is really simple. the pieces are well numbered and the picture in the assembly instructions is easy to understand. I do not recommend the screws that are included. The thickness of the equipment and drywall allow only 1/4 inch into the joist. In one room we had sprayed popcorn ceilings. We used a piece of carpet to protect the textured ceiling. We were delighted that there was no tax or shipping charge. The box was very well packed. The pole has permitted my mother to start bathing again. It has been one of the best things we have bought her after a major illness. She is 93. She has been sponge bathing as we don't have a shower in her house, only a tub. She was so skeptic about the pole, but when we tried it, and she could "walk" herself up enough to lift her leg to exit the tub, she was thrilled !! Us, too. She can now have bathes again and the water is so theraputic to her pysical and mental health. She has control, and will eventually be able to take a bath unsurperivsed. It is all a tribute to the pole. We also appreciate the quality of the powder coating, the strength of the product's support elements, and the engineering that has gone into it. To have an affordable medical product is almost unheard of !! Very impressive item and we have used it a bunch. 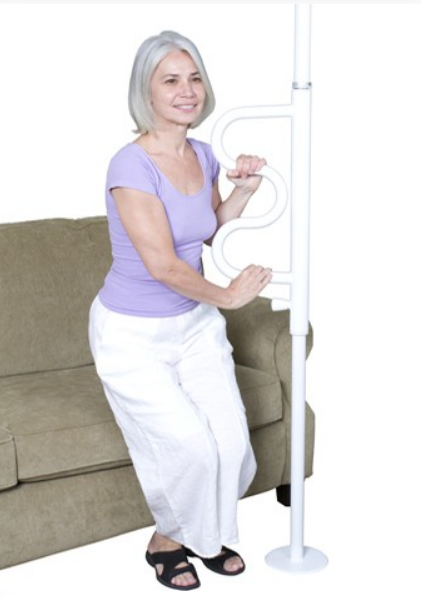 I ordered this bar for my mother-in-law, It works very well for her in the shower and helps her with her mobility.